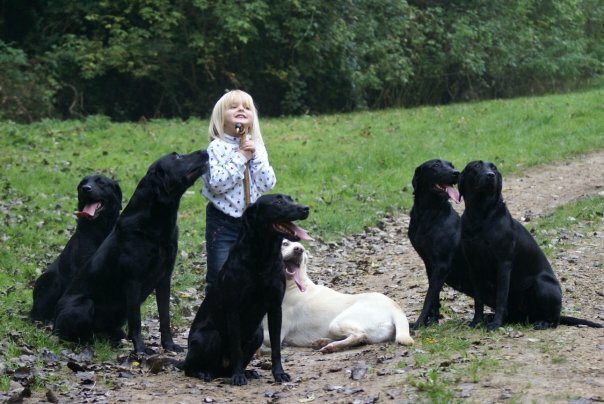 Honour: A dog that waits while another retrieves is said to have honoured. Depending on the temperament and drive of your dog you will either sail through the honouring part of your training, or will go into line when you have to honour in a state of dread and anxiety, knowing that there is no way your dog will remain steady while another dog is running out to retrieve that oh-so-desirable dummy or bird. The futility of “cold” honouring: What many handlers do when teaching the dog to honour is to do many “cold” honours. A “cold” honour is when you let your dog watch other dogs working over and over again. I don’t believe that has anything to do with teaching a dog to honour. What your dog needs to learn is the sequence; first you run the series, then you honour the next dog. (Every once in a while the judge will play some games and not have that kind of honour, but that usually only happens in the higher stakes). Get into the habit of leaving the line after honouring under control. Practice heeling away from the line by doing a U turn (turn into the dog) and heeling off lead a few paces before putting on the leash. The event style of honouring goes smoothest if it makes sense to the dog. If you practice the sequence he can see that the cues differ from those that predict he will be sent. Also, for a young inexperienced dog it is possible to design the session so that the stimuli are not so overwhelmingly exciting that he can’t think about what’s going on and what he has seen. So, for the young dog with a lot of retrieve drive, begin by making things simpler for him than a “formal honour at the line”. Once he has delivered his retrieve, heel him away from the line – far enough away so that it really does not look like the “line” to him and so “dilute” his excitement level a little. You are taking away the environmental cue of being in the line means a retrieve. 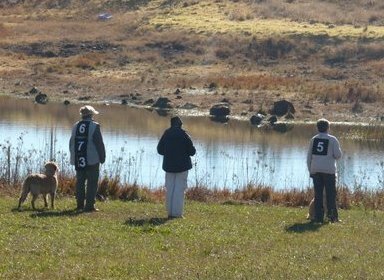 You will also let him watch the “working” dog come into line as this will also become a cue that the next retrieve will not be for him. The departure of that dog to retrieve will also be a cue to relax and expect something different than being sent. The moment the working dog is sent and after your dog has seen it take off, get your dog’s attention and get him focussed on you. Don’t even worry about getting him to sit – this will come later – he can just be standing there on his leash, still excited because he has just retrieved and wondering what is happening next. He hears gunfire, sees another dog take off, and instead of thinking about running out to get the retrieve he immediately orients back to his handler. Orienting to you can be rewarded by giving him a treat as soon as you see him notice the other dog’s departure. After a couple of sessions once he is offering you his focus when the other dog departs, you can start cueing him to sit when he resisters the working dog’s departure, followed by a treat. If he won’t accept treats in this circumstance, substitute some praise or petting. Then walk him quietly away on leash “under control” so it is good to not develop habits that are the opposite of control. With repetition you will see your dog visibly relaxing the moment the other dog is sent and voluntarily (no cue from you needed) turning his attention on you since he expects that a departing working dog means focus on my handler now. At this stage you can occasionally dor a formal honour where he is a sit adjacent to the line. If you have a dog that is still going crazy even after you have left the area of the line, then move him to an area where he does not actually see the throw, but can hear the gunshot and hear the working handler’s release cue. Spare the Rod and Spoil the Dog? I Think Not! I have just been re-reading some of the Retriever training books which I acquired years ago when I started out training retrievers for field work. I used these books to plan and guide me in my training. In those days, the seventies and eighties most retriever trainers had never heard of operant conditioning, clicker training, classical conditioning, and, even if they had they hadn’t thought of applying the science to their training methods or even questioning what they were being taught by their trainers. These methods were often passed on from mentor to student over and over again. I think it was probably because, harsh though they were, these methods worked. Trainers using these methods were winning field trials and working tests. There is also the belief that in order to compete at a higher level you need to be able to “correct” the dog for his mistakes. Mistakes that very likely came about as a result of inefficient, incomplete and outdated training methods. All this just goes to show what amazing animals our dogs are to put up with this abuse. Abuse at the hands of their handler who insists that he loves his dog! The science of animal behaviour has come a long way since those days and we are learning that physical, corporal punishment is a very rocky road on the way to learning. 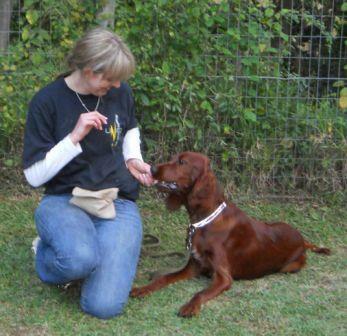 As recently as 10 to 15 years ago, most dog training was done with compulsion and force. These days, however, more and more trainers are using positive methods as they have been found to be more successful and less traumatic for the dogs and puppies. We try to reinforce correct responses rather than punish incorrect ones. We raise criteria gradually. We split behaviour into tiny slices instead of trying to teach large complex lumps. We learn to observe what our dogs are doing and how they are responding. We keep our rate of reinforcement high in the early stages of learning and we look at our timing. It is this consistency and clarity that will create a more confident dog who has good manners around people and other dogs, trusts his handler and looks to his handler for all his needs. Bad behaviour only happens because it has, in some way been reinforced, either inadvertently by you or members of your family, or by something in your pup’s environment. I’m not saying that we should be permissive dog owners – on the contrary, we need to teach dogs that there are rules to follow – these rules mostly require the dog to exercise self-control, which is always a good thing. The rules involve highly predictable behaviours for interacting and connecting with their handler. And these rules can easily be taught without any force or compulsion. It is simply a contract that you enter into with your dog; “You can get what YOU want if you give me what I want”. You are currently browsing the Louise's Dog Blog blog archives for August, 2014.